The Jim Henson Company's two most senior U.K./European production execs, Martin Baker and Angus Fletcher, have been moved sideways to production deals with the company, which is cutting its operations. Company described Wednesday's announcement as reflecting its continuing commitment to its U.K. operations. The Henson family paid Germany's EM.TV $89 million to buy back the company last May. Baker and Fletcher have played an integral role in the company's prolific film and television output over the past two decades. Most recently Baker was exec VP of production and Fletcher was president of Jim Henson Television --- Europe. In his new role, Baker will be the company's primary contact for all U.K.-based film, television and theatrical projects. 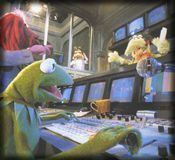 During his 24 years with the company, Baker has been involved in TV and film projects such as "The Muppet Show" and "Fraggle Rock" as well as "The Muppet Movie" and "The Dark Crystal," among others. Jim Henson Pictures is producing two feature films in the U.K., "Five Children and It" and "MirrorMask," both for release next year. Fletcher will co-produce a large slate of future projects that he initiated during his tenure at the company. A creator and producer, he is responsible for preschool programs including "Jim Henson's The Hoobs," "Jim Henson's Construction Site" and "Mopatop's Shop." The company said the appointments are part of the restructuring of its global operations that will focus on its entrepreneurial and creative roots.